Ann Stampler has written many absolutely wonderful children's books, and when she verged into the YA category, I know I was extremely happy. AFTERPARTY marks her second YA book, and it came out January 1st. We are very very excited to share her wisdom with you today! As anyone who has ever met me or read my YA novels knows, I am not a childlike-sense-of-wonder, happy-teen-stuck-in-a-grown-up-body kind of a person. Books about how you get all the life lessons you need in kindergarten leave me banging my head on the table and eating my crayons. Nevertheless, when called upon to come up with helpful writing advice, I keep coming up back to things that I brought with me from childhood, and which I use every day in my work. Mostly, these writing tools are things we’re encouraged to shed with a vengeance as we approach adulthood. My advice is: don’t. So here you have it, the shameless list of all the things I did unselfconsciously as a child that I still do intentionally when I write. 1.) Pretending to be someone else. This is not the same as walking a mile in your character’s bedazzled moccasins or developing empathy for your character; it’s actually pretending to be that person. Do you remember as a kid getting so deeply into the character you were pretending do be that you didn’t have to try anymore? You just were that pirate/princess/monkey/cowboy. Or, in my case, a guy named Raymond who wouldn’t go to bed until my mother said, “Goodnight, Raymond.” (Really.) Do that. Think about what it was like when you played dress-up. Think about opening your eyes draped in your grandmother’s scarves and seeing the inside of Ali Baba’s cave instead of your grandma’s finished basement. Think about opening your eyes and seeing what the person you’re pretending to be -- the character from whose perspective you’re writing -- sees. 2.) Hearing voices. This works best if your imaginary friends, dolls, and stuffed animals spoke to you. But even if you were the one making up all the voices of all of the characters speaking to each other, that works, too. Even though the well-balanced grown-up you are is perfectly well aware that you are making up all these voices as you go along, try to lean back and enjoy the ride. Try for as little awareness of your own effort as when you were ordering monsters out from under your bed and the monsters refused. Loudly. Or better yet, when you eavesdropped on the conversations of all those damned monsters. 3.) Being shameless in loving the details you love. Remember how in your set of Russian matryoshka dolls, the second to smallest one had the red apron dotted with globs of gold paint in the shape of tiny leaves? And the only reason you played with that nest of dolls was to get to that red and gold apron? Yeah, you do. Remember the pink plastic jacket that you used to sleep in despite that fact it was eighty degrees outside and your house didn’t have air conditioning? Write those crazy-in-love details. They might be random and you might have to slash some of them later in a “kill your darlings” moment, but some of them will be perfect and wonderful and define your character in ways that pages of exposition couldn’t touch. I’m not telling you to lose authorial control of your writing and get all careless and self-indulgent and weird, and write crap. I’m saying, let your characters be who they are complete with flaws, mistakes, hideous mistakes, life-altering mistakes, bad decisions, weakness, and ornery temperaments without authorial interference. If that’s who they are. And let them resent the hell out of you and reject your interference if you become the parental authority that jumps in to clean them up and make them toe the line and fix things for them. Be them. And in your capacity as them, do not let the authorial authority boss you onto the path of righteousness and inner-strength and goodness. They want to do what they want to do. They want to figure things out for themselves. Let them. Where It Began was amazing, and I look forward to reading Afterparty. Thanks for the great advice! This is a great post chock-full of good writing tips. 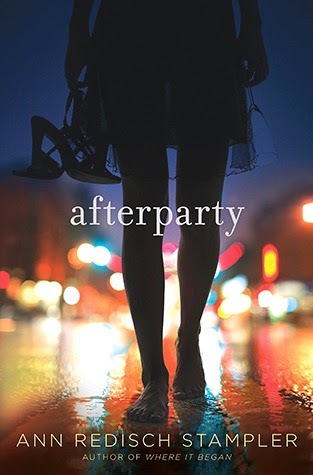 Afterparty sounds like a terrific book. Thanks for all of this. Loved WHERE IT BEGAN. AFTERPARTY here I come. #2 is my fave - or at least the voices tell me #2 is my fave.